Full Tilt Poker was the 2nd biggest site in the world before Black Friday. Once they went offline no one was sure if they'd return, and if they did, if they would be able to regain the traffic they once had. I'm glad to report that they have. They launched in November of 2012 and immediately took the 2nd place spot in terms of overall traffic. Even during off peak hours they have 12,000+ players on their site. Other than traffic, Full Tilt Poker is known for their pros. Their roster currently includes Tom Dwan, Gus Hansen and Viktor Blom, whom of which are all known for battling it out at the highest stakes. The best part is that even if you can't play high stakes for real money, you can at least watch the pros battle it out. Then take what you learned to your favorite stakes. Sadly, US players are not allowed to play on Full Tilt Poker. You can still play for play money though, and if you have the real money poker download you can still rail other real money players. Creating an account at Full Tilt Poker is simple. First you'll be asked to choose between a PC or Mac download, and once that's complete, you'll need to create your account. Just give them your name, address, email and screen name and you'll be all set. If you need more information, we offer a Full Tilt compatibility / download page here. Well, actually, you'll need to make a deposit first. You can do that using Neteller, FirePay, money transfer, emoney transfer, Visa/MasterCard, MyWebATM, ePassporte and Click2Pay. These methods work for both deposits and withdrawals. Since FTP is owned by PokerStars, you will also have the convenience of transferring money between both accounts. That means no more missing out on tournaments because you have all of your money on one site. Full Tilt Poker offers all new players a 100% deposit bonus up to $600. So if you deposit $250 you'll be given $250 extra. The best part about this bonus is that you can make 3 separate deposits to take advantage of the entire bonus, so long as you do it within 60 days of the first one. The bonus will be released to you in 10% or $20 chunks, whichever is the smallest. Your bonus will clear at the rate of $1 per 25 Full Tilt Points. 10 points are given for every $1 raked in cash games and 10 points for every $1 you pay in tournament fees. You'll have 4 months to clear each bonus. In addition to the bonus you'll also receive 10 free tickets to the $50k freeroll, as well as a $2.25 tournament ticket. 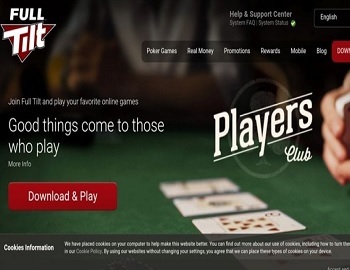 Full Tilt Poker runs a number of ongoing promotions. Here are some details about the most popular ones. Edge: Edge is the new rewards program that replaces the Iron Man and Black Card VIP programs. This new program consists of 5 levels that uses rolling averages to figure out your level. In other words, you can move up to Silver if you earn an average of 50 points per day, but you can also move up to Silver if you earn an average of 25 points for every 100 days. So Edge rewards consistency just as much as it rewards volume. Each level will reward players with tournaments, freerolls and weekly cash payments. Happy Hour: During Happy Hour you will earn 2-4x the normal amount of points. Just sit at a table during Happy Hour that is labeled with a yellow smiley face to earn points at a faster rate. What Poker Games Can You Play at Full Tilt? 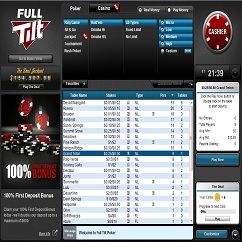 There are too many games at Full Tilt Poker to list individually. Just know that you have a lot of options. For example, in ring games you can play holdem, omaha (hi/lo), 7-card stud (hi/lo), razz, draw and mixed poker games. Stakes run from .01/.02 to 2k/4k depending on the game. There are multiple options for sit n go tournaments too. My favorite are the 90-man knockouts, which are soft, even up to the $50 level. Other variations includes heads-up, 6-max, full ring, knockout, step and deep stacks. Buy-ins start at .30 and end at 5k. That doesn't include the run-of-the-mill (guarantee) tournaments that run throughout the week. All tournaments can be bought into for dollars or points, or entered via satellite. Last, but not least -- FTP is known for their Rush Poker games. In Rush Poker you can fold as soon as you want and you'll immediately be taken to a new table and dealt a new hand. This form of poker gives you the opportunity to see 200-400+ hands per hour. It's available in both cash and tournament formats.